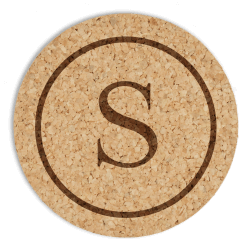 Our new Harvest Coasters are beautifully engraved and made from cork. Enjoy a variety of other designs. What do you use as a coaster at your house? We admit it, sometimes we use this week’s newspaper or the latest HGTV magazine. But no longer! Our new personalized coasters look terrific on a wood coffee table as well as a glass-topped table. 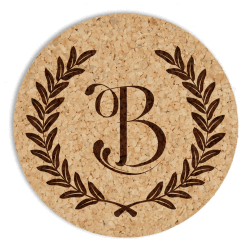 Made from high quality cork, we’ve embellished these coasters with a variety of beautiful monograms and lettering styles. From country to modern, classic and casual, they strike the right note for any kitchen, living room, basement den and beyond. What’s more, you’ll be proud to display these personalized coasters on your counter. You can even give them as a memorable housewarming gift. In addition, we offer designs you can personalize for special events — like a signature birthday, a wedding or other special occasion. Plus, you can even give them out as party favors. See all new coasters here. Our Rockford Coaster comes in three fonts, including two brand new exclusive designs you’ve never seen before. 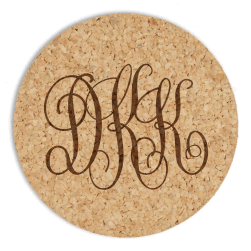 Our Monogram Coaster comes in 6 beautiful monogram styles.